Trucks will be available for a 2 hours period with a minimum of 2-3 short breaks for battery replacement and track maintenance. No guest limit - Batteries last 15-20 minute each so plan accordingly if you have more than 4 guests interested in driving the trucks. It's rare the trucks become damaged but when they do there is no charge but there may be some down time for the repair. Party quest are welcome to come 15 minutes earlier and stay 15 minutes after for clean up. Track is still open to public but chairs are available including bleachers for track side viewing. Options available to rent our party room for food, gifts, entertainment and quests (reserve in advance please). 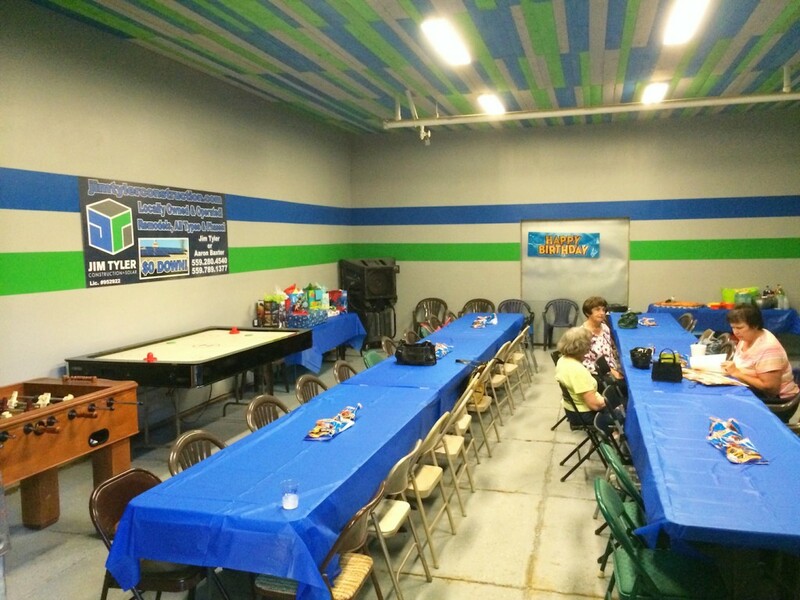 If you purchased the rental of our back party room, your welcome to bring your own food and non-alcoholic drinks. Our Pizzas prices are hard to beat considering the quality of food and delivery service from VIP Pizza. Custom catering is available from a great choice of local venues. See management for your options. For After Hour Parties that are private in nature your welcome to bring your choice of food and beverage and use our front table area next to the track since the facility is closed and for your use only. Custom Invitations are available for you to print or email at no charge. 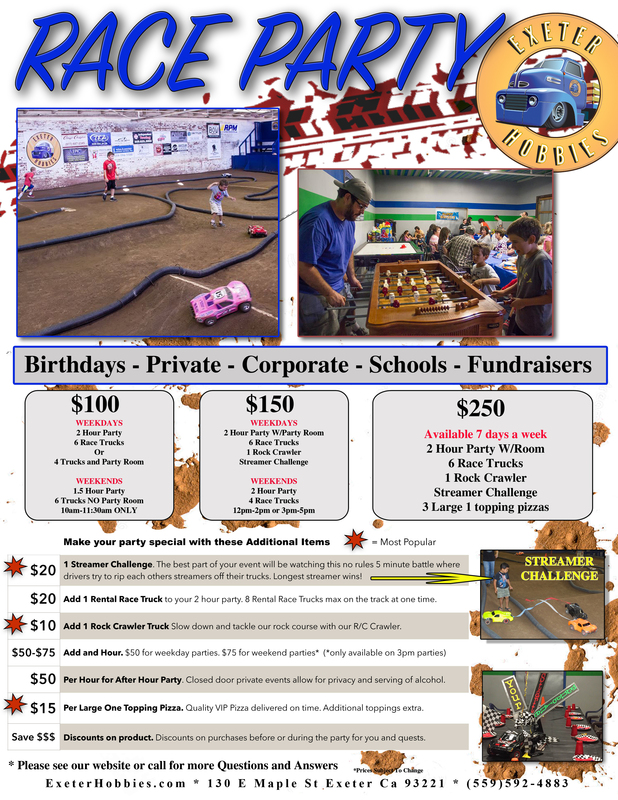 Visalia Areas only indoor racing experience. Kids Birthday Parties, Private Corporate Parties or just a group a friends looking for some good wholesome entertainment. 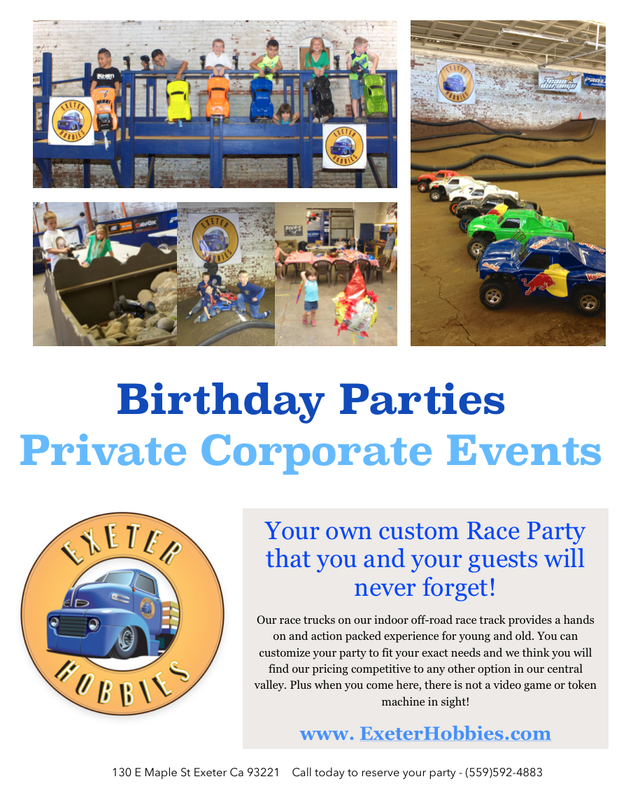 We can design your party to fit your needs, just give us a call. I was wondering what age group this is for? 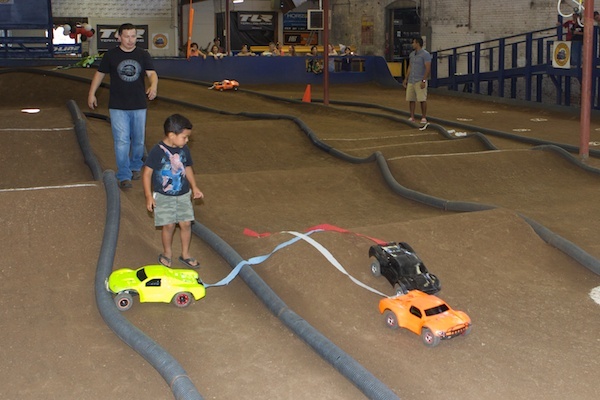 We have had kids as young as 4-5yrs old but their ability to drive the cars around the track will depend on their coordination and experience with other RC’s. Normally kids at 6-7 do just fine with our trucks. If you curious, bring one of the kids in and we will let them try a truck out on the track. 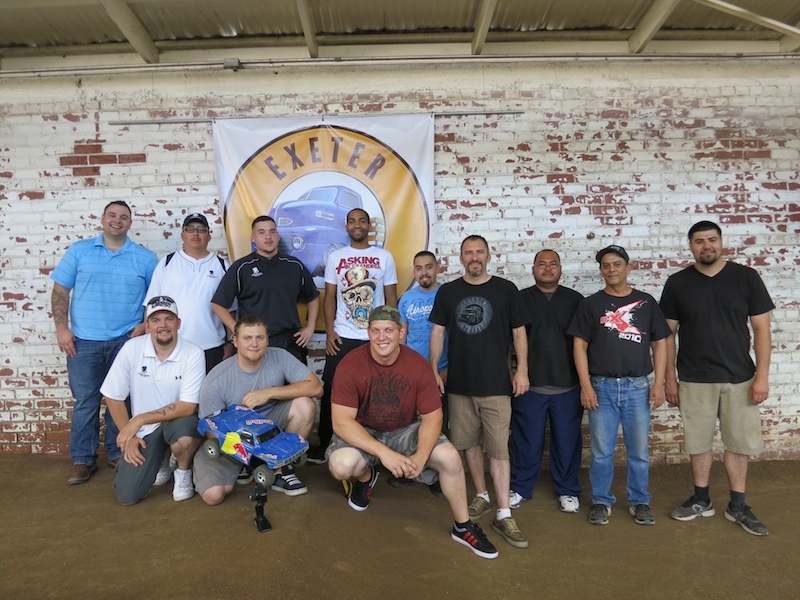 I have a 1/8 Team Associated RC8.2e buggy, and I am wondering if I can race it on your track, or is it too big. We do not allow 1/8 cars on our track. Our track is just too small and the big fast car damage the track and pipping. Sorry for that but if your ready to sell your 1/8 and pick up a 1/10 we are here to help. Would like to know the cost of a party for 10 children! The amount of children does not change the price. We have a limit of 5 trucks at a time, so you would have to work with the kids to make sure everyone get a fair time with the trucks. Most parties will use the trucks 3-4 batteries which last 15-20 minutes each. So you could just allow 5 to run till the batteries go out and then swap kids. Or however you feel would work best for your group. 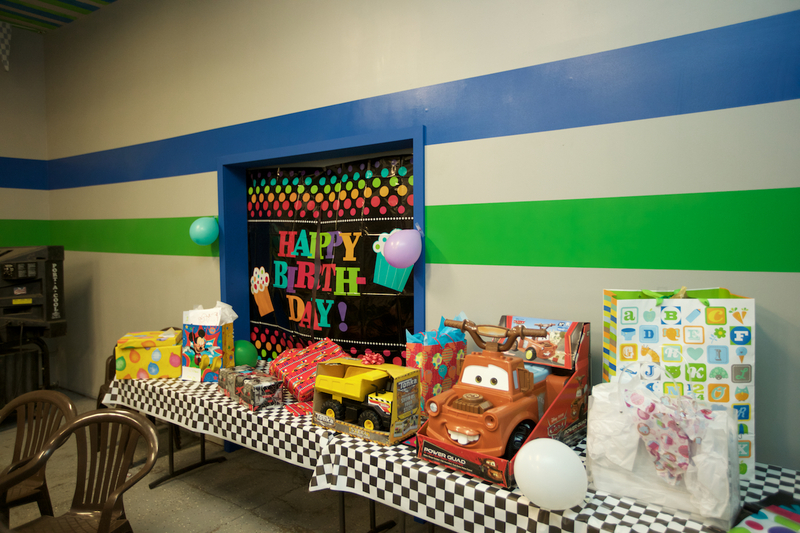 Recently we had our son’s 5th birthday party here and it was a HUGE hit!! He only had a few of his friends from school come, so the majority of our guests were family between the ages of 3 and 60…and everyone was impressed and had an amazing time. My cousins husband even bought a R/C Car because he had so much fun. My oldest son has already asked if we could have his party there in May and there was no hesitation. It’s a great place to bond with your family and I will continue to recommend it. Hello and thank you for this nice comment. We hope your ok with it but I will post this on our Facebook page so our fans can see how much fun our parties can be. We look forward to having you guys back to the shop! Thanks again! Of course! Thank you and your staff for showing us a great time!!!! Quick question. Are the game tables actually in the party room? I just booked a party with you guys and didn’t get a chance to look. Yes they are. So they are just for your party room. You can look at the site or come in if you want to get ideas how to set up the room or decorate etc. looking forward to having you here! 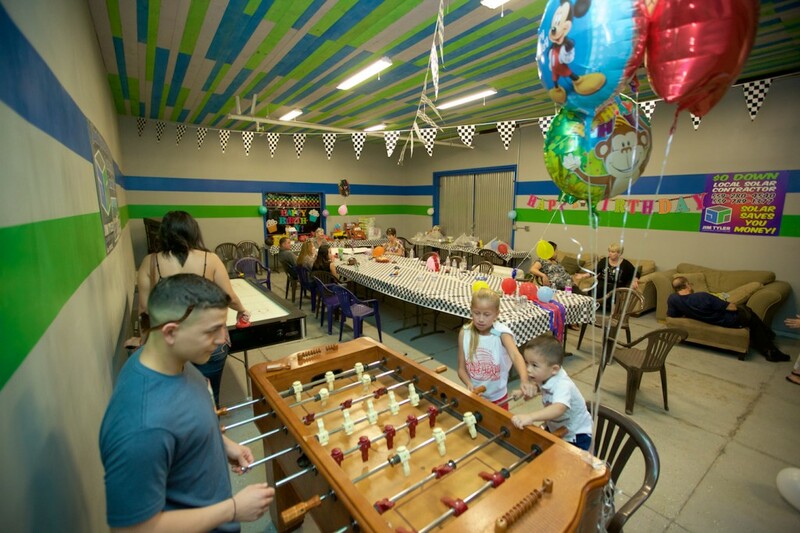 We have had very young birthday parties here but often if they are under 7-8 it’s the parents driving the kids just running around and helping the parents drive or rescue their cars. 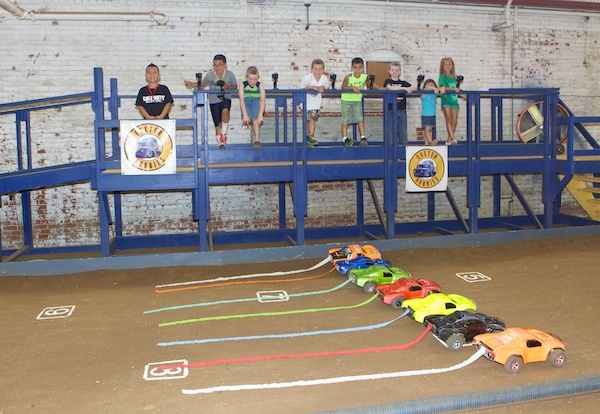 But to answer directly, no most 3 year old or even 5 year olds can’t really drive the RC cars well around our track.